How can a find the last cell on a spreadsheet based on a given color? This VBA macro code allows you to select a cell with a specific fill color and it will automatically determine the last cell within your spreadsheet containing the designated fill color. The code uses an Inverse For Loop to cycle through each cell within the UsedRange of the spreadsheet in reverse order. There are three options provided to point your user to the resulting cell. Excel MVP Rick Rothstein submitted this alternative way to find the last colored cell. I like this solution as it is much shorter and I am assuming faster. 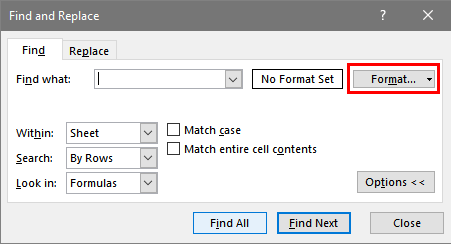 'Store active cell's fill color into "Find"